Perhaps it was all the talk about food — or lack of it — but after an early start (and an early breakfast) on the first day of visiting schools and clinics, by midday I was feeling distinctly peckish. And there was another problem. We were rapidly falling behind schedule, with me asking never-ending questions, Petterik the photographer trying to fulfil his mission, and it being slow going over the rugged Tigray landscape. Lunchtime came and went — with nothing eaten. By mid-afternoon, I began to feel somewhat fractious. After leaving the home of 13-year-old student Rahel Zewde — who certainly hadn’t eaten lunch either — we bumped into 80-year-old Berhe Kahsay. With a USAID baseball cap on his head, a white shawl around his shoulders, and a walking stick in a hand, he invited us to his home — for coffee, crucially. Now I’ve learned how quality Ethiopian coffee is close to as good as a meal in itself. And after the raw green beans were roasted over a charcoal brazier, ground in a mortar and pestle, and brewed, I saw out of the corner of my eye a young girl bringing a tray of freshly made bread. My heart rate increased notably. I just managed to restrain myself from taking the largest chunk. What resulted might as well have been a banquet — coffee and bread never tasted so good or nourishing. Eventually I managed to remember why I was there, and, turning to the drought, asked whether it had knocked the faith of this Christian people. The following day’s trip to the neighboring eastern province of Afar resulted in the same routine: an early start and breakfast, a long bumpy drive, visits and interviews as the clock raced on — and lunchtime come and gone, accompanied by my unsated belly. Added to which, I noticed with gnawing anxiety that not even a tin shack of a café appeared to exist in the surrounding barren environment. Then, it seemed an angel spoke. The words, though, came from our more earthbound guide, Daniel Zigta, with the Ethiopian Catholic Church Adigrat Diocesan Catholic Secretariat. In one hand, he carried a bag of bread rolls, while one of the group of locals also accompanying us clasped a metal pot, the size of a large bowl. As we set down on the rocky ground, squatting on haunches, the lid was removed to reveal locally made dark, yellow-brown viscous honey. Next Daniel and his fellow Ethiopians tore off chunks of bread to scoop up dollops of honey, motioning for Petterik and me to do the same; it didn’t take long for us to respond. That sort of meal doesn’t take long to pack away, and soon we were soon back in the truck heading to our next appointment. Re-energised after my Afar-style lunch, I was more than ready to get back to my notetaking, and once the sun started to lower, bathing the landscape in a mellowing golden hue, my increased spirits were sustained all the way back into Tigray and to the hotel. It’s remarkable what a simple full stomach does for morale — and frightening how quickly an empty one takes effect. 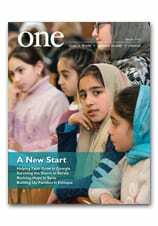 To learn more about how drought and hunger are affecting the people of Ethiopia, read When Rain Fails in the Spring 2016 edition of ONE. In this image from February, employees prepare a convoy of four trucks transporting warm clothes and shoes to Ukraine, at the initiative of the French Red Cross in Saint-Quentin-Fallavier, eastern France. Pope Francis over the weekend appealed for more aid for the people of Ukraine. A Coptic villager in Upper Egypt checks his cellphone while transporting crops across town. Egypt is often left out of discussions about the “Holy Land,” yet it is the land where St. Joseph took Mary and Jesus for safe haven. Sometimes the ancient history of the Pharaohs, the pyramids and the many archaeological treasures diminish the biblical importance of this land. But Christians in Egypt, unlike in most of the Middle East, are truly at the bottom of society. Generally, they are the least educated, own very few businesses and are considered “second class,” or the outcasts of society. Many live in sprawling urban ghettoes, where many make a living picking and sorting garbage. Others live in very poor rural villages where they till the soil as indentured servants to wealthy landowners. One sister said, “They don’t dare take one head of grain to eat.” In either setting, however, their faith is alive. Despite being extremely poor and living in horrible conditions, such as sleeping on a mud floor with their oxen and pigs, they relate to their local parish as an extended family and do everything needed to sustain each other, even to the point of taking in orphans or those children or elderly who have no one to care for them. Read more and see his gallery of photographs here. And take a moment to hear him describe his visit in the video below.